A town by any other name—even Eel Pot!—would be just as appealing as Brunswick is today. Yes, “Eel Pot” was just one of its many past monikers. Buffalo Wallow, Coxson Rest, Potomac Crossing, Tankersville, Berlin, and Barry round out the list of former names for this attractive canal town. In 1890, the Baltimore & Ohio Railroad (B&O) settled on “Brunswick” because many railroad workers in the area came from Brunswick, Germany. The railroad maintains a large presence today, Brunswick being a major stop on the MARC Train line, an important commuter rail into Washington, D.C. Freight also passes through. 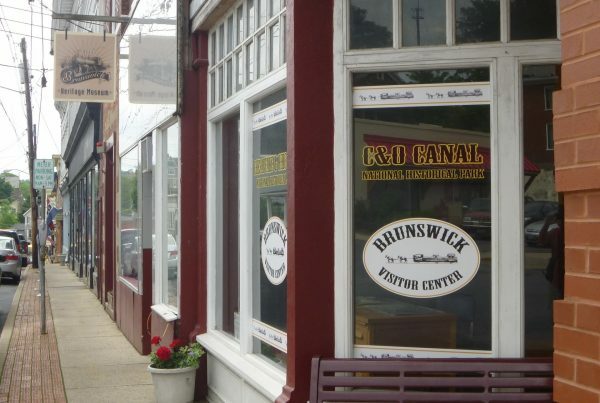 On these two journeys in the Brunswick area learn how the railroad and canal shaped the town. Walk or bike along the Chesapeake & Ohio (C&O) Canal towpath and see the remarkable restoration of the Catoctin Aqueduct. Explore the bucolic countryside of the surrounding mountains and valleys on a scenic excursion to Gathland State Park to learn about the Battle of South Mountain. 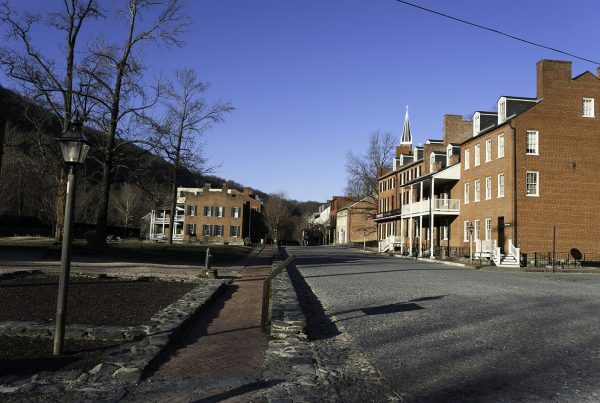 Other nearby towns of interest include Point of Rocks and Harpers Ferry, West Virginia. This itinerary explores historic Brunswick and nearby Gathland State Park, where you can learn about the Battle of South Mountain. In 1753, Brunswick was part of an original 3,100-acre land grant to John Hawkins from the King of England, George II. The land was known as “Merry Peep O Day” because the rising sun could be seen directly over Catoctin Mountain. In 1780, the land was deeded for four town lots, and in 1837 John McPherson bought the new little burg. The original town was situated between where the railroad tracks lie today and the C&O Canal. The railroad and the canal both arrived in 1834. 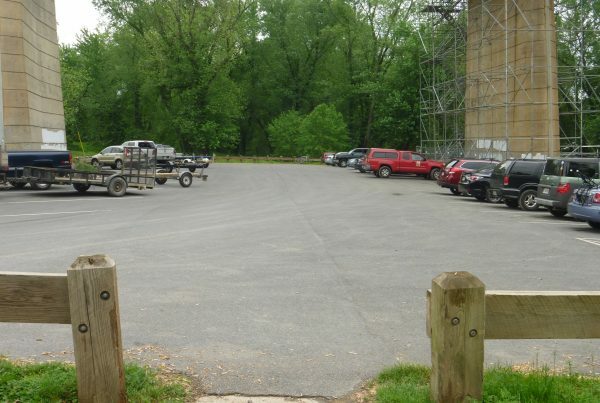 Begin your explorations of town at the C&O Canal Visitor Center (free) and Brunswick Heritage Museum (admission fee), 40 West Potomac St. (southeast corner of Potomac and Maryland Ave.). Together, the museum and visitor center interpret the building of these two important transportation systems. Peek into the lives of “canawlers”—those who made their living along the canal—as well as the railroaders who brought the B&O to town and kept it running. The museum recreates rooms in early 20th-century homes, depicting how residents lived. The top floor features 1,700 square feet of model railroad and Brunswick’s rail yard shown extending all the way to Union Station in D.C.
Next, take a walk or short bike ride through town to see some of Brunswick’s historical sites. From the C&O Canal Visitor Center and Train Museum, head east on Potomac Street and cross Maple Avenue. Head north (left) on Maple one block to East A Street and turn east (right). On the next block down you’ll see a tank in the road median. The M–5 “Jeb Stuart” Tank was a gift to the town from the US Department of Defense following WWII. An interpretive sign tells more about the 15-ton gift. Retrace your steps back to Maple Avenue then head down hill toward the river and the railroad tracks. Just before crossing the tracks, the Queen Anne style B&O railroad depot is on the right (now owned by CSX). Lying at the edge of Railroad Square park, the pretty gabled depot is listed on the National Register of Historic Places. In its current location since 1907, the station was the last in CSX’s system to have a real person as a ticket agent. Also in Railroad Square you’ll find a bell memorial erected to the memory of three local railroad employees who were killed in a train accident in 1996. Looking from the depot down the tracks (east), you’ll see the old WB (westbound) Tower, originally built in the early 20th century and used as a signaling station. Men stationed inside the short tower ensured that trains moved safely, on time, and on the correct route. Brunswick was one of the last places where people manually carried out these operations. When a computerized system was installed in late 2011, the tower became redundant and efforts to preserve this piece of B&O Railroad history are underway. There are plans to move the tower and open it to visitors. Brunswick Main Street sponsors several events throughout the year, including History Days in April; the Great Brunswick River Race in July (make your own boat and sail it down the Potomac); Bicycle Festival in August; Railroad Days in October (music, festivities, train rides); Wine & Chocolate Walk in September (tastings from local vineyards paired with scrumptious treats), and a Victorian Christmas on Thanksgiving weekend. For a complete list of events, visit Brunswick Main Street. From Brunswick drive or bike to Gathland State Park, a small collection of interesting stone buildings built by George Alfred Townsend in the late 1800s. Gathland sits at Crampton’s Gap, one of three skirmish sites—along with Fox’s and Turner’s gaps—of the Battle of South Mountain. Gathland is only 7.5 miles from Brunswick. Take MD 17 (Burkittsville Rd.) north out of town, following its winding course to the village of Burkittsville. At Main Street (Gapland Rd.) turn left and begin heading up the mountain. At the crossroads with Arnoldstown Road, turn right at the arch then left into the parking lot. George Townsend was a journalist, writing for the New York Herald during the Civil War. He purchased the property after the war, not only for its beauty but for its proximity to the battlefield of Antietam. “Gath,” Townsend’s pen name, comes from his initials with a terminal “H.” The name was inspired by a biblical passage: “Tell it not in Gath, publish it not in the streets of Askalon.” (II Samuel 1:20). At one time Townsend’s little estate consisted of 20 structures, including his tomb, where he was not buried in the end. You can see the tomb and a few other standing buildings. A series of interpretive signs allow a glimpse into Townsend’s life as well as more details about the Civil War engagement here. In addition, the Appalachian Trail passes right through. The most interesting structure by far is the giant stone arch—The War Correspondents Memorial—built in 1896 and inscribed with 157 names of the journalists and artists who covered the Civil War. Two of the standing few buildings are open on weekends only, spring through autumn, and feature artifacts from Townsend’s life, career and estate, as well as from the Battle of South Mountain. For more information: 301-791-4767. On September 14, 1862, troops under Confederate Brig. Gen. Howell Cobb and Union Maj. Gen. William B. Franklin clashed at Crampton’s Gap, part of the Battle of South Mountain. Several interpretative signs scattered about the Gathland estate take you through the sequence of events. Though Franklin drove away Cobb’s forces, he failed to pursue the Confederates (erroneously believing he was outnumbered), allowing the Rebels to capture Harpers Ferry the next day and “Stonewall” Jackson’s corps to reunite with the main Confederate column in Sharpsburg. Three days later, they clashed again at Antietam. South Mountain was the first major battle north of the Potomac River. It was also the first Union victory over any segment of the Confederate Army up until that time. Imagine waging war across this challenging rocky and wooded terrain. On your way back to Brunswick, stop by the charming town of Burkittsville. Fighting at the gap actually began when Cobb fired on Franklin’s troops as they marched through Burkittsville toward the mountain pass. Homes, businesses and churches in the village were used as hospitals to tend to the Union wounded. At PJ Gilligan’s Dry Goods & Mercantile you can buy a reproduction of household goods from the Civil War era and earlier, as well as modern-day gifts.